So I’m making my summer mudroom work double duty with the cute things on display and the clutter hidden away. Who says coat racks are just for coats? 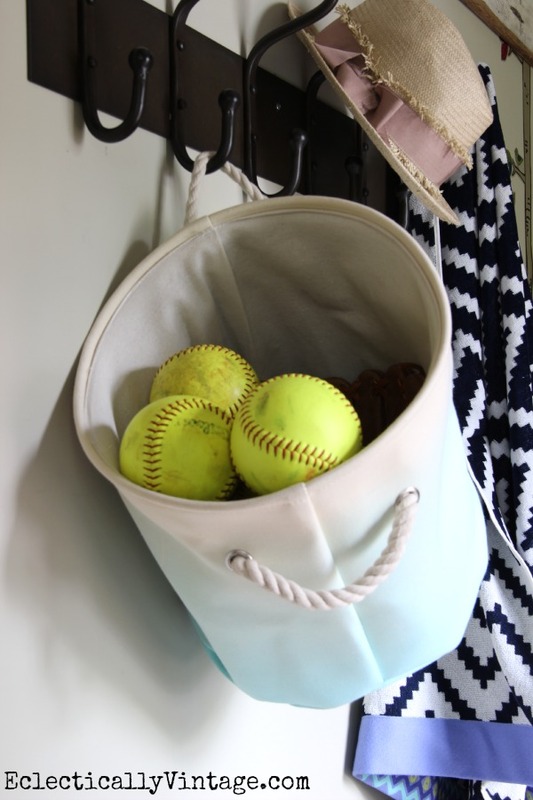 This basket will be holding everything from softballs to sunglasses to sunscreen. I’ll never hear the words, “honey, where are my BBQ tongs” again now that everything is tucked neatly behind these closet doors. How I can keep him from constantly misplacing his wallet and eyeglasses is another story. I’m off to the pool. Check out my house tour to see more. i love how happy it looks! 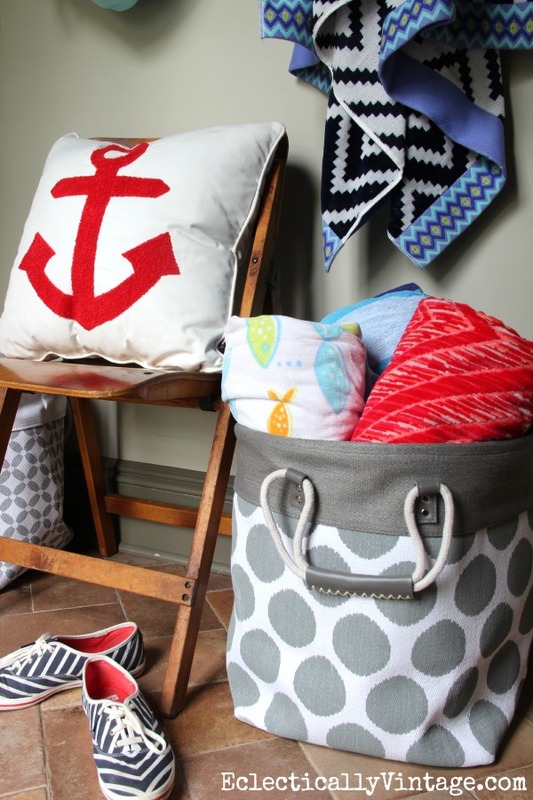 the anchor pillow and baskets are awesome! great space. 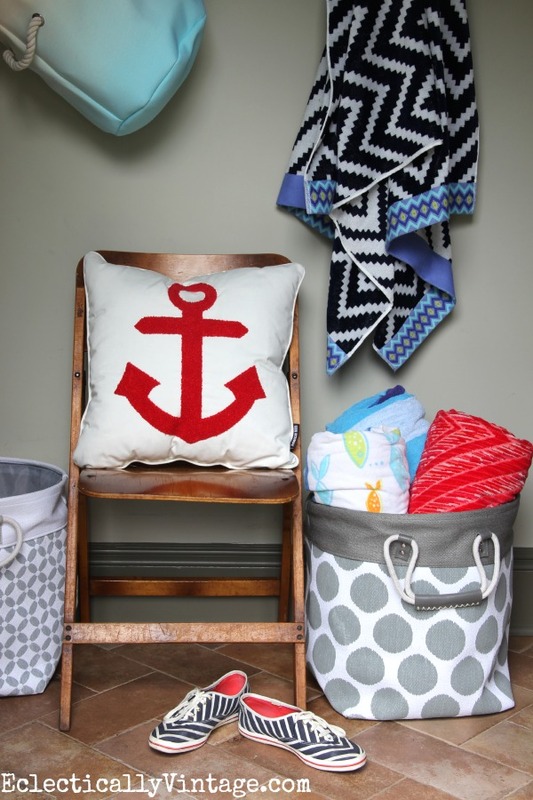 I love that anchor pillow. Kelly – I love, love, love that rustic dinner sign! The whole space is definitely “summer ready”! 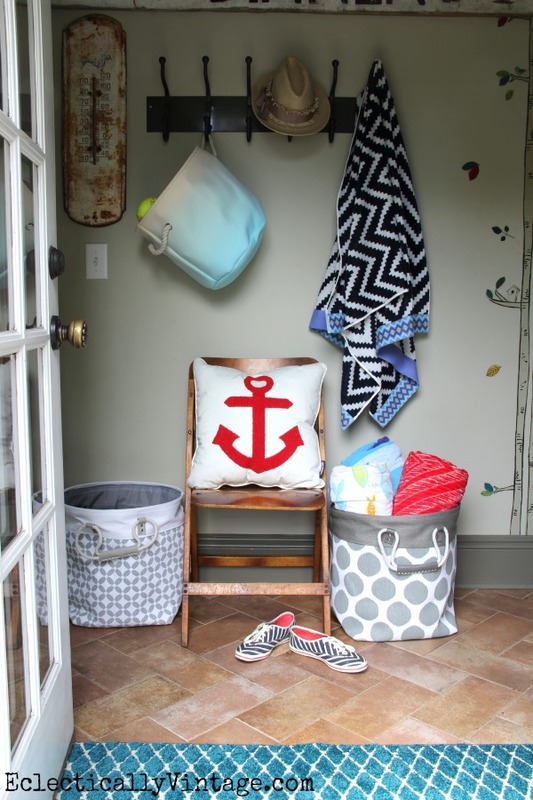 Also, love that red anchor pillow! I wish I had a mud room! It would be a great place to keep up with all the kids stuff! Maybe in my next house. 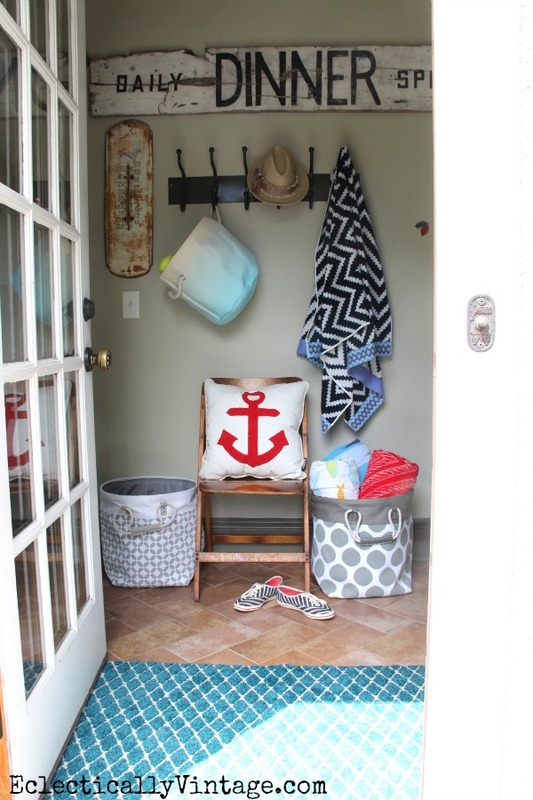 Oh how I love the way you decorated and organized your mudroom for the summer….I so wish I had a mudroom!!! It makes me smile! What a fun way to make a room feel like Summer! Awesome room and those totes are incredible, they look really sturdy and can put lots in them. Way to go. When kids were still all home we pretty much left beach stuff in car trunk, put clean beach towels by front door ready to go. Had a cooler ready almost constantly. During most of my kids growing up years we lived inland from beaches in San Diego. Many times in summer half the neighborhood would go with us. They all knew the rules about time to go, bringing their own lunch/drinks, money and time to check in. They were all good kids, are still friends of oldest son who moved back to S.D. after his divorce. You have things so nicely organized, did you have that cupboard in room before? Very handy. Hope you have a great summer. Have fun most of all, and remember the sunscreen for everybody. 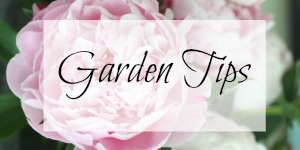 Love your mudroom! Have fun at the pool! such a cute space! 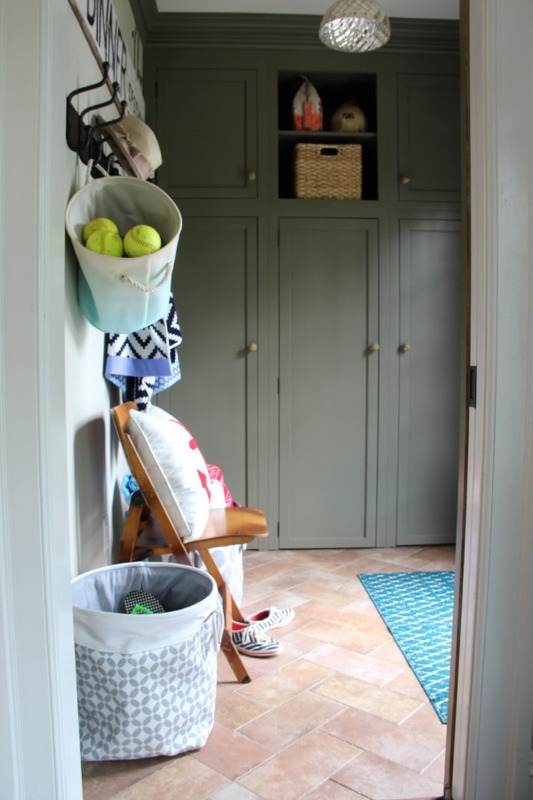 I would love to have a mudroom! Love the whole room, I always have!! 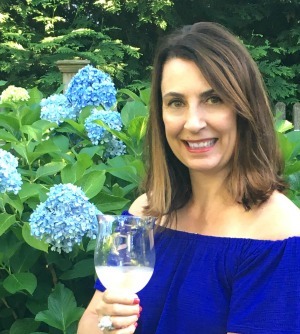 The nautical twist is super fun for Summer and you’ve got it set up to be so useful and hardworking too. A 2’fer. Pretty and practical. Perfect! And oh, I’m jealous of those Kate Spade Keds, they ran out of my size when I got to finally see them, they are super cute! No I found it behind a wild blueberry stand in Maine! Got it for $10! Which colors did you use on trim/cabinets and walls.